Posts Progenitor of ‘Bhut Jolokia’ Found? Progenitor of ‘Bhut Jolokia’ Found? 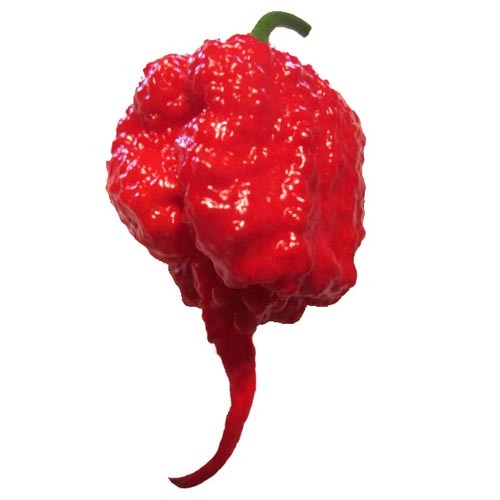 For the 5+ years that the rumors and then stories about the superhot ‘Bhut Jolokia’ from Assam in northeast India have surfaced, I’ve wondered about its origin. Pods of Capsicum chinense are found all over the Caribbean, from the Scotch bonnet in Jamaica to goat peppers in Haiti to bonney peppers in Barbados. However, it is the country of Trinidad & Tobago that seems to have the largest number of land races of that species, including the Congo pepper, the Scorpion, the 7 Pot, and now the Jonah 7, pictured here. Of all of these, it’s the Jonah 7 which most resembles the ‘Bhut Jolokia’, and the India connection to Trinidad is very clear: 40% of the people have an Indian ancestry, as compared to 37.5 % with an African ancestry. So it’s my theory that sometime after the Indian migration to T&T began in 1845, some enterprising person took Jonah seeds to India and they ended up as Bhut Jolokia, or “ghost pepper” in Assamese. Recently, Marlin Bensinger, a friend of mine and the world’s foremost expert on capsaicin extraction and testing, performed HPLC tests on the Jonah 7, and it was in the precise heat range of ‘Bhut Jolokia’. So maybe a mystery has been solved! Thanks to Jim Duffy in San Diego, who grew out the pods and photographed them. My comment back is that in this particular instance, Harald’s ‘Bhut’ certainly does resemble a ‘Fatalii’, but pod variations within a land race are common, and sometimes the pods on the same plant have different forms. 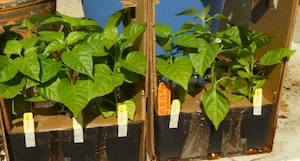 See another pod shape of the ‘Bhut’ at right. This is because they are land races–adapted varieties that have been growing in the same geographic area for hundreds of years–and not recently bred-to-be-true varieties. The only way to really figure this out is to compare the DNA of all these varieties.